Do you ever wonder where nursery rhymes come from? Although they are simple songs to children today they are often based on difficult or unpleasant times in the past; for instance, ‘Ring a ring o’ roses’ is said to be about the Back Death which devastated the population of England in the Middle Ages. But what about Humpty Dumpty? Who was he, why was he sitting on a wall, and what made him fall? The general consensus amongst historians is that this nursery rhyme originated during the English Civil War. By 1648 King Charles I had been captured by the Parliamentarians and was being held prisoner. In the hope of freeing him the Royalists planned an invasion of England by a Scottish army, those in England who supported the King were to rise up at the same time. But the Scottish invasion was delayed, the Royalist forces in the east of England were attacked by Lord-General Fairfax and retreated behind the walls of Colchester. Fairfax surrounded the city and a siege began. The siege lasted from 12th June to 28th August 1648. In defence of the city several artillery pieces were set up on the walls. The biggest gun was placed on the walls of St Mary’s Church. 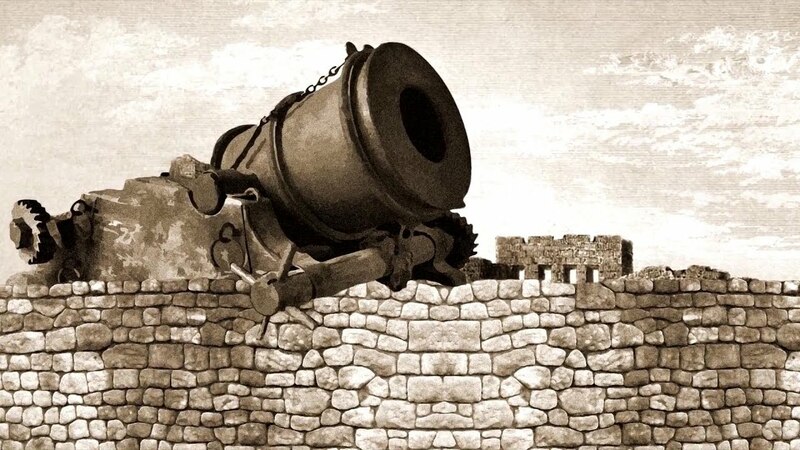 This gun was one of the largest at the time and so called Humpty Dumpty, which was a common nick-name for an overly large (or over weight) person. A drawing of the real Humpty Dumpty on Colchester Wall. Could not make Humpty where he was before. Despite the deplorable conditions for the people living inside the city walls – things were so bad that people had to resort to eating soap and tallow candles – Colchester continued to hold out until the end of August. The Scottish invasion had eventually come but the army was defeated by Cromwell on 19th August; news of the Parliamentary victory reached Fairfax on 24th August. On the morning of the 28th the defenders of Colchester finally laid down their arms and surrendered. My novel ‘The Cavalier Historian’ tells the story of the siege of Colchester in detail; a tale of suffering and hardship, of lost hope and defeat. A pivotal moment in British history which few know about yet which is celebrated by English children every day in the nursery rhyme ‘Humpty Dumpty’.